We are trying to recover from illness here, but I wanted to share at least one Eastery image. I didn't have a chance to make any special treats, as I feel pressure to do after looking at other crafty mom blogs, but we did celebrate. 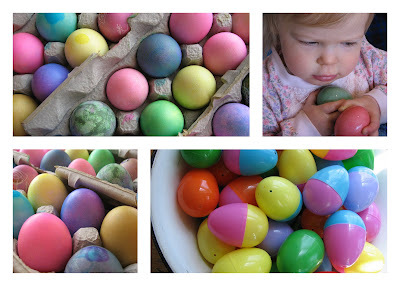 We did dye eggs, eat eggs, stuff plastic eggs with treasure (my kids weren't expecting candy, thank goodness, but were happy to pop in a few raisins and chocolate chips-we'll see how long that lasts! ), hid and hunted eggs in the cold Chicago air, ate the ears off a chocolate bunny, and remembered the resurrection of Jesus. P.S. Thank you for the book recommendations you've been leaving. I have a couple of your suggestions on hold at the library and am looking forward to reading them. Happy pictures. I love Easter. I love it even more when I don't have to go to the Sunrise Service. Love those pictures. Don't ever feel pressure to do things because others are- you do what you can! Sweet pictures! Looks like L isn't about to relinquish those eggs. Reminds me of her gathering up all the train cars at Barnes & Noble & carrying them off! I am glad that you had a nice Easter! What's up, well put together web-site you've gotten presently.